Select the different stages to view the upstream process. 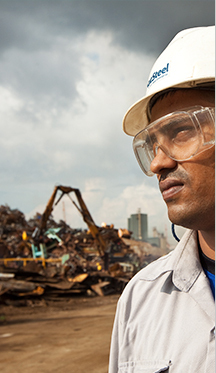 As the largest metal recycler in Singapore, NatSteel Recycling processes more than half a million tonnes of locally generated metal waste into radiation-free, quality steel annually. 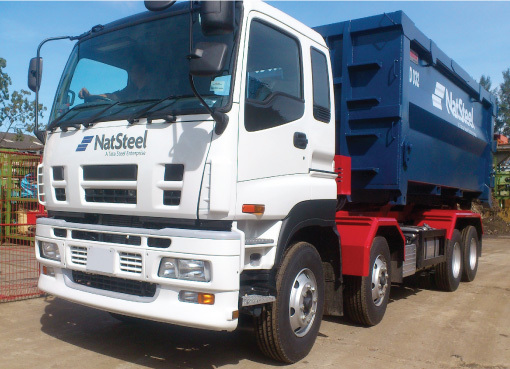 Metal waste is collected from marine, demolition and construction industries with a dedicated fleet of collection bins and trucks. 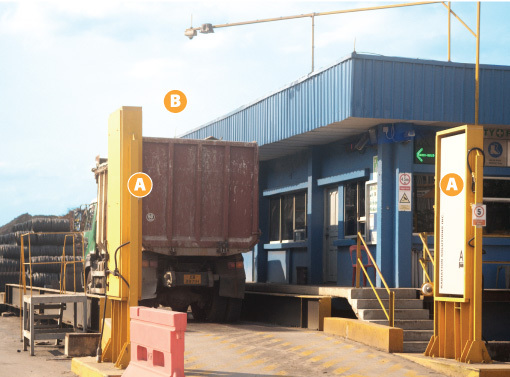 These bins and trucks now come with improved safety and environmental features. Incoming metal waste is first screened for radiation and weighed before unloading. 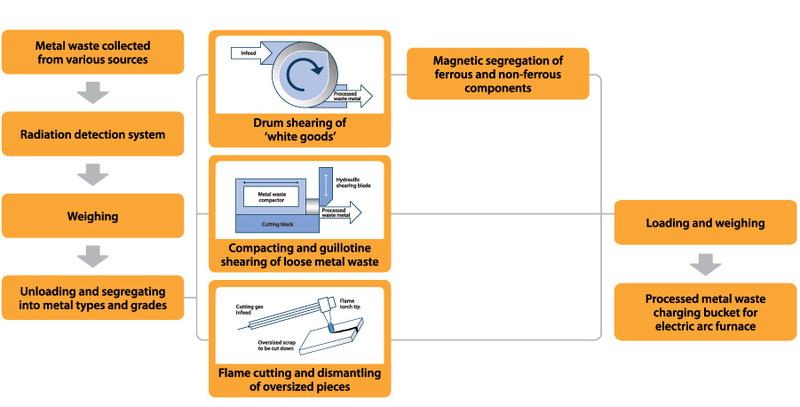 Metal waste is segregated and further processed by various cutting methods to sizes optimal for melting. 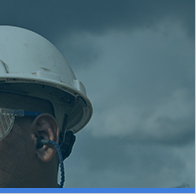 NatSteel has one of the most energy-efficient operations in the world. Typical steel mills operate electric are furnaces using about 400 to 450 kilowatt hours of energy to produce a tonne of steel. NatSteel does the same with about 30% less energy at 300 kilowatt hours. 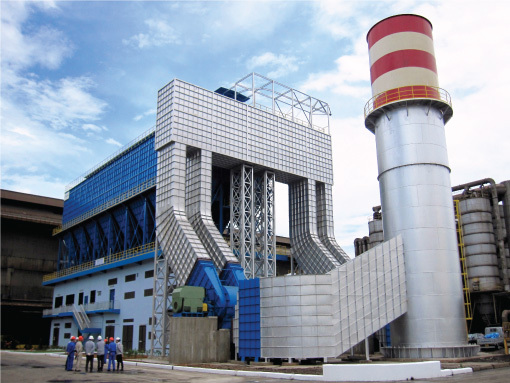 Processed metal waste is melted in the electric arc furnace with fuel oil burners and high voltage current, enriched by oxygen jetting. During this melting process, slag and dust is generated. 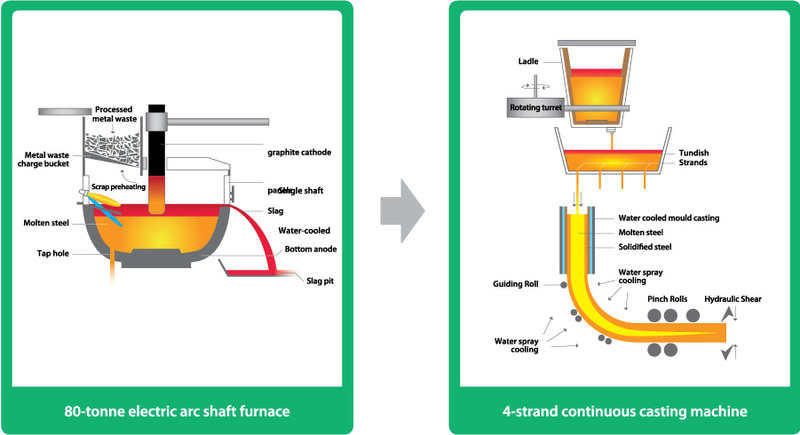 Molten steel is transferred to the 80-tonne Ladle Furnace for chemistry refinement and temperature control. Refined moleten steel flows to this machine with a 4-strand high speed caster. Billets are cast from it and are directly hot charged to the rolling mill, resulting in fuel oil savings. Steel slag is recycled into road aggregate which has better quality than natural granite and widely used in Singapore' public roads. 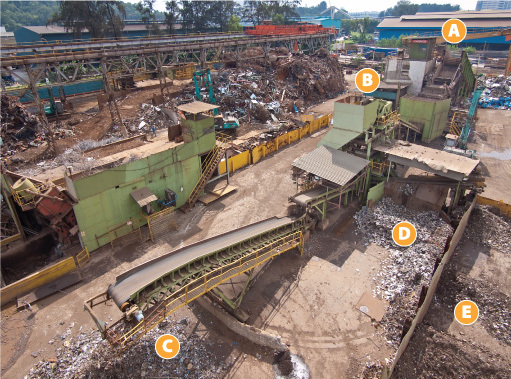 This is estimated to save about 860,000m³ of landfill site in Singapore, if the steel slag was to be disposed as waste. Steel mill dust contains mainly volatile zinc oxide fines. In NatSteel, we work with an external technical partner to recycle our steel mill dust into zinc ingots in overseas zinc smelters. At the Merchant Bar Mill, billets are rolled into reinforcement bars and wire rods through an automated process.